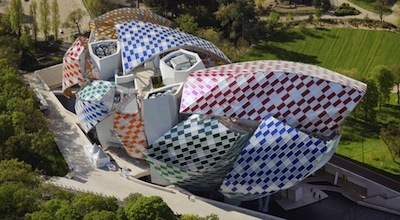 Fondation Louis Vuitton is being overtaken by colors via a temporary art installation dressing the building’s exterior. The elaborate installation, titled “Observatory of Light,” debuts May 11 and will cover LVMH’s Fondation Louis Vuitton with a “play of projections, reflections and transparencies” across its 12 sails. As a patron of the arts, Fondation Louis Vuitton has housed many art exhibitions since its opening, but this marks the first time the building itself was the focal point of the piece on display. Observatory of Light was created by French artist Daniel Buren and dresses the Frank Gehry-designed Fondation Louis Vuitton in colored filters. The temporary installation shows Fondation Louis Vuitton in a new light by projecting colors off of its 12 sails. Each of the building’s 3,600 pieces of glass will be covered with bright colors and white and clear stripes. 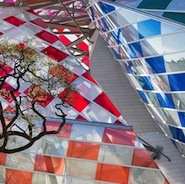 Guests within the Fondation Louis Vuitton, those outside and others from afar, will see the reflections of 13 different colors as they change throughout the day and with the seasons. Running parallel to Observatory of Light, visitors to the Fondation will the opportunity to experience BurenCirque, a contemporary circus act. On three different occasions, BurenCirque will perform at the space opposite Fondation Louis Vuitton. Conceived by Mr. Buren with Dan and Fabien Demuynck, BurenCirque’s performing talents interact with exhibitions designed by the artist. Performances will be held on June 2-4 at 9 p.m.
A children’s concept will also be included for visitors. Young art lovers ages 6 to 10 can join “The Light Trap” workshop to learn more about the installation until the end of August, between the hours of 2:30 and 5 p.m.
Fondation Louis Vuitton has spent time ensuring that its young guests get the most out their visit. For instance, Fondation Louis Vuitton introduced the ArchiMoi apprentice architect app for children. The interactive app allows children ages 6 to 12 to explore the Fondation Louis Vuitton building through self expression inspired by the designs of Mr. Gehry.